This lack of a directive or announcement of sorts from the three chapter 13 trustees in Chicago is disturbing. After all, chapter 13 success is primarily based upon timely payments by a debtor. When a debtor is on payroll control, the funding for the chapter 13 plan comes directly from the wages. The debtor has the understanding that the chapter 13 trustee payment will be deducted from the pay. The debtor’s attorney is under the impression, as in the past, that the trustee will forward and communicate with the various payroll departments with regard to the executed orders. Since there has been no directive from the trustees, it is unclear whether the debtor’s attorney should forward that order to the payroll department, whether it needs to be amended each time there is a modified plan payment and whether or not the trustee or the debtor’s attorney should forward such amended order to the payroll department. What we have right now is total confusion. The reason why there is confusion is that debtors’ attorneys and debtors don’t know for certain whether or not the trustee is going to continue processing the orders once they are entered or whether the trustee is going to be completely hands-off and rely on the debtor’s attorney to handle that administrative aspect of the case. We also don’t want to see duplicate orders and duplicate letters being sent to payroll departments which could only confuse the situation. I can picture a situation where the payroll department is the deducting twice pursuant to an order from the trustee and an order from the debtor’s attorney, both duly executed. It would be great if there was a directive or memo or other explanation as to how the matters are going to proceed now that the new proposed order is in place. In fact, within just a few days, the order will have been in place for nearly a month. In the past, if there was a modified plan or other change in the plan payment, and an order was already in effect, the trustees would typically send a letter to the payroll department advising that the dollar amount should be adjusted. It is unclear whether this system will remain in place. It seems more likely that an amended payroll order would be filed, executed, and then submitted to the payroll department by either the trustee or the debtor’s attorney. I think we are all just hoping for a little direction in terms of what role the trustee will have with regard to payroll control orders, amendments thereto, and effective administration of those orders. Once we know what functions the trustee will perform, we can then make adjustments accordingly. Until such time, we very well may have duplicate entries, double the work, and potential harm to the debtor if more than one payroll control order gets enforced. We are just looking for a little guidance and help ladies and gentlemen of the chapter 13 trustee community. 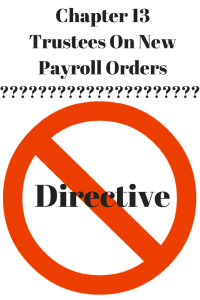 Just a little help is all we ask for when there is such a significant change in procedures with regard to payroll control orders. You seem to act quickly when a court decision affects your internal procedures. Why not do the same when a new local order takes effect?